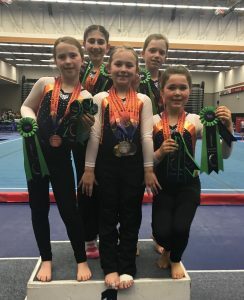 Powell River’s Junior Gymnastics Team leapt over the waters to attend the 25th Annual Christy Fraser Memorial Invitational meet in Langley, BC. This was the inaugural trip for the Junior Team to attend one of the larger Lower Mainland meets. This annual meet in Langley hosts over 700 athletes over two days. Coach Desiree Young was extremely pleased with the girls’ performances given that every athlete placed in the Top 10 for their division. As a combined team, the 6 girls brought home an impressive 3 Gold medals, 2 Silver Medals, 3 Bronze medals and 21 Top 10 Placement ribbons. Olivia Raffin was the overall winner for the Junior Olympic Level 1 category. She brought home 5 medals including the Gold All Around, also bring home a gold for beam, silvers for bars and floor and a bronze for vault. Larissa Laing brought home the Gold medal for vault, the Bronze medal for bars, 6th for floor, 7th for beam, placing her 4th All Around. Panagiota Rounis brought home the Bronze medal for bars, 4th for beam, 7th for vault, 9th for floor, placing her 7th All Around. Samantha Lambert brought home 4th for bars, 5th for beam, 6th for floor, 8th for vault, placing her 6th All Around. Kyla Randle brought home 4th for floor, 5th for bars, 9th for beam and 10th for vault, placing her 9th All Around. Gabrielle Marshman competed in the higher Level 3 Junior Olympics category. She brought home 6th for vault, 8th for beam, 9th for floor, placing her 10th All Around. The Junior Team will travel for one final Lower Mainland meet in May before heading into summer -training where they will learn their new skills for the upcoming 2018-2019 season. 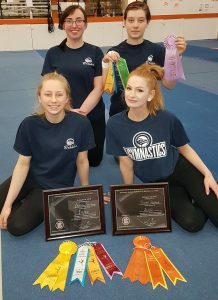 Four of our senior gymnasts attended 2018 Artistic Gymnastics BC Championships last month to represent Powell River on the Provincial platform. The Gymnastics BC Provincial Championships is the premier annual gymnastics competition in the province, demonstrating some of the best qualities of our sport: spirited competition, sportsmanship, camaraderie, and the drive to achieve goals. 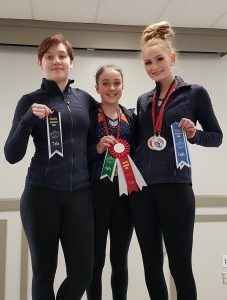 What’s more, it sets the stage for athletes of all ages and skill levels to compete for the title of BC Champion in both artistic and trampoline gymnastics. Over 2000 athletes attend this annual event. Team members in attendance included Ekaterina Senilova, Katie Dohm, Trystinna Bailey and Hillary English. These girls train 24 hours per week throughout the year as they are competing in the higher optional levels of the Junior Olympics Program. Teammate Hillary English competed in the Level 7 (2004) division. Hillary’s brought home the Silver medal for bars with a season’s best 9.316, finishing 8th place All Around. Katie Dohm competed in the Level 9 (2000-2004) division achieving 10th place All Around with her best event being floor where she earned 8th place. Senior athlete Ekaterina Senilova competed in the Level 10 (2000-2002) division. Katya’s placed 12th All Around with her best event being a season best 8.2 on the beam which placed her 7th. 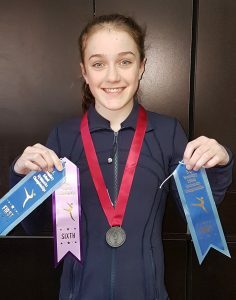 [Powell River, BC, May 8th 2018] A contingent of five top level gymnasts travelled to Abbotsford, BC last month to compete in the 2018 Twisters Invitational competition which is held over two weekends. The team earned a combined 3 medals and 14 Top 10 placements for the Sunshine Coast. Hillary English competed in the Junior Olympic 7 division for gymnasts born in 2004 & 2005. Hillary took the bronze medal on bars and placed fourth on the beam, placing her 5th All Around for her division. 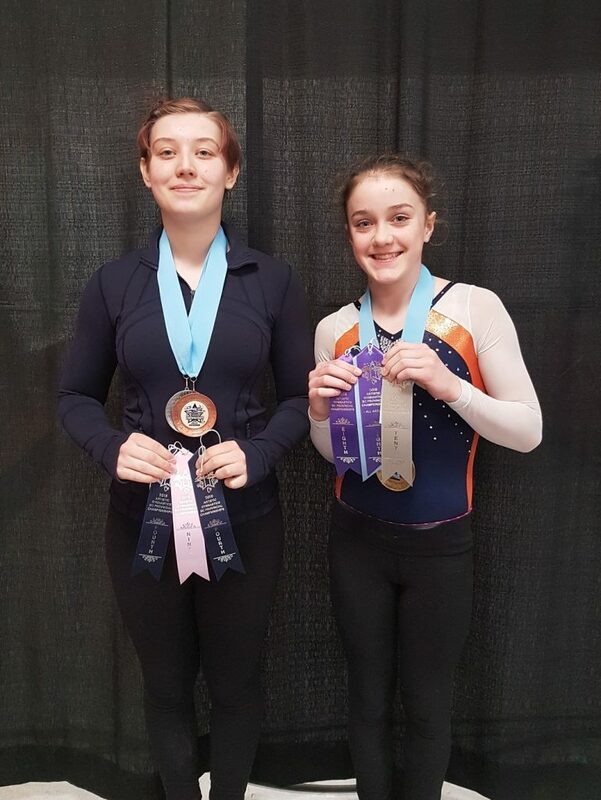 Teammates Rachel Peckford and Trystinna Bailey duked it out in the Junior Olympic 7 division for gymnasts born in 2000-2003. Rachel earned the silver medal for vault, 6th place for bars and beam, 10th place for floor, earning her the Bronze medal All Around. Trystinna placed 10th for bars and 7th for floor. Katie Dohm competed in the Junior Olympic 9 division for gymnasts born 2000-2002. Katie earned 7th place on vault, 6th place on bars, 8th place on beam, 4th place on floor, placing her 7th All Around for her division. Ekaterina Senilova competed in the Junior Olympic 10 division for gymnasts born 2000-2002. Ekaterina placed 10th on vault and 7th on floor. 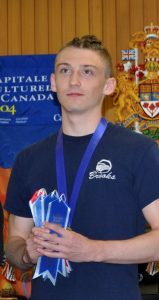 Brooks Gymnastics’ high school program has once again produced outstanding results at the recent B.C. Secondary Schools Championships, hosted by Windsor Secondary School in Burnaby, BC. Brooks level 4 WAG team, Rachel Peckford and Trystinna Bailey, finished second in the overall team standings. Brooks level 5 WAG team, Ekaterina Senilova, finished sixth in the overall team standings. Brooks level 5 MAG team, Dylan Werner, finished first in the overall team standings. Graduating Brooks Secondary students Ekaterina Senilova and Rachel Peckford were the recipients of $4100 and $1200 in bursaries respectfully. Top 10 results were realized by Brooks’ Dylan Werner, Ekaterina Senilova, Trystinna Bailey, Rachel Peckford and also by Powell River Christians’ Hillary English. Powell River Christians’ high school program was a single athlete this year – Hillary English. Hillary finished sixth overall in the WAG Level 4 team standings (a team can consist of 1-3 athletes). Hillary’s individual scores were very impressive with two 1st place standings and one 2nd place standing. 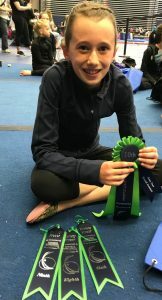 All the student athletes are part of Powell Rivers’ Gymnastics co-ed high school program designated for Grades 8-12 and accommodates absolute beginners to high elite level gymnasts. The program is coordinated by Ken Holley and also includes coaches Paulo Pena and Desiree Young of Powell River Gymnastics Society. 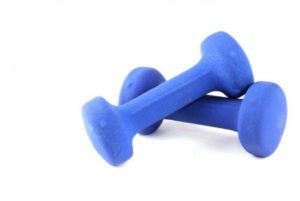 The High School portion of the program runs from November through March; however, there is a complimentary Teens program so teens can train and cross-train to compliment other sports from September through June. Here is a complete rundown of the 6 athletes who participated at provincials. Jessi Burge (Brooks – Grade 12) – 31st All Around, 23rd vault, 26th bars, 28th beam and 22nd floor. Hillary English (Powell River Christian – Grade 8) – 2nd All Around, 6th vault, 1st bars, 1st beam, 17th floor. Trystinna Bailey (Brooks – Grade 10) – 6th All Around, 4th vault, 10th bars, 5th beam, 11th floor. Rachel Peckford (Brooks – Grade 12) – 8th All Around, 11th vault, 8th bars, 8th beam, 14th floor. Ekaterina Senilova (Brooks – Grade 12) – 4th All Around, 6th vault, 3rd bars, 7th beam, 4th floor. EVERYONE WELCOME! ALL AGES ~ EVEN ADULTS!! Come and enjoy the gym with your kids….. all ages are welcome today. No PRGS memberships fees are required to participate. On your 2nd visit, we *must* activate GymBC Casual Insurance of $15. 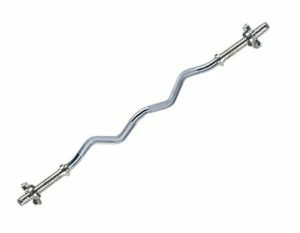 We are looking for Barbells, Weight Plates and Dumbbells. If you have these items around the house not being used. We could sure put them to good use here at the gym. Drop by today to register for a class! Space is limited, and classes fill up quickly. Pro D Day Camp Registration On Now! We are Offering Day Camps for Professional Development Days. Space is limited – register today! 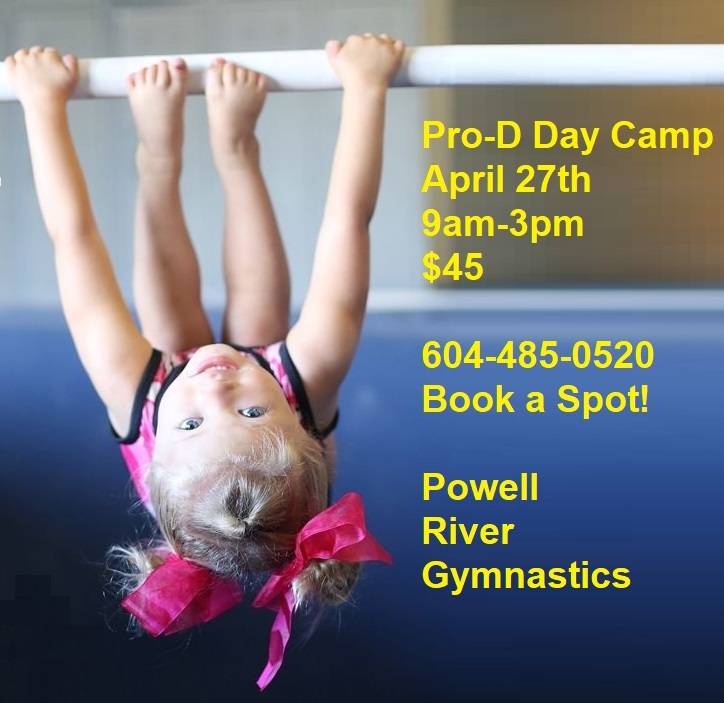 For questions and to register, please send an email to office@prgymnastics.ca or give us a call at 604-485-0520. Our NEW Head Coach is here!! Paulo Pena grew up in a small Brazilian town, starting to train at age 7, and travelling 4 hours a day to realize his dream of becoming a high-level gymnast. During his career, he was all-around champion of the three biggest states in Brazil (Rio de Janeiro, Sao Paulo, Minas Gerais) and National champion (1997-2000, 2004). He spent five years on the Brazilian National team (1998, 2000-2002, 2005). During this time, they were champion of the South American games; as well as, placed second and third in the Pan American championship. He was fortunate to be mentored by international coaches from Armenia, Ukraine, Cuba and Brazil, who inspired Paulo’s passion for coaching. Athletes from recreational to National level have thrived with his planning and leadership. Paulo performed with Cirque du Soleil, Corteo, touring in North America and Japan for 5 years. He continues to perform special events with the company. Armed with a Bachelor Degree in Sport and 24 years of experience, Paulo is excited to join Powell River Gymnastics and raise his young family here. He believes that gymnastics is a complete sport which develops mind, body, and motor skills to carry for a lifetime. Paulo’s goal is to bring out the best of each athlete and most of all, in a fun way!